Ever since we were in middle school, beginning as a part of our school's Robotics Club, we have participated in the VEX robotics competitions, starting from 'Toss Up' (2013 - 2014), to this next season's game, 'In the Zone' (2017 - 2018). Since our high school does not have a robotics club, we decided to compete in these VEX games as a self-sponsored team, known as the Quantum Harmony BioDragons. We were first introduced to VEX robotics when we started our first years at Springfield Middle School as MAGNET students. For Stephanie, it was her first year of Middle School, and for Elizabeth, she had transferred from her old Middle School, Northern Middle, to spend her last eighth grade year at Springfield. Soon after the school year started we both signed up for our school's robotics team, not knowing what to expect but excited for the challenge. What we experienced that year, influenced the journey of hard work and determination to make it to Global's. The First Year was tough, not gonna lie. Everything was new and the game, challenging. Not to mention that our team met only once per week on Thursdays for about 45 minutes. And that was certainly not enough time to build a robot that no one knew how to build. Even our teacher, the Robotics club president, had little clue of what to do. This is because it just so happened that, that year was Springfield's first year in doing VEX Robotics. So to everyone, this was a totally new experience. After watching the video detailing the new game of 2014, everyone was then sorted into teams of five, and then let loose like lost ducklings in a corn maze. However that year, Elizabeth, stood up and took the lead. Urging everyone on the team to go home and research different designs and strategies for the game. 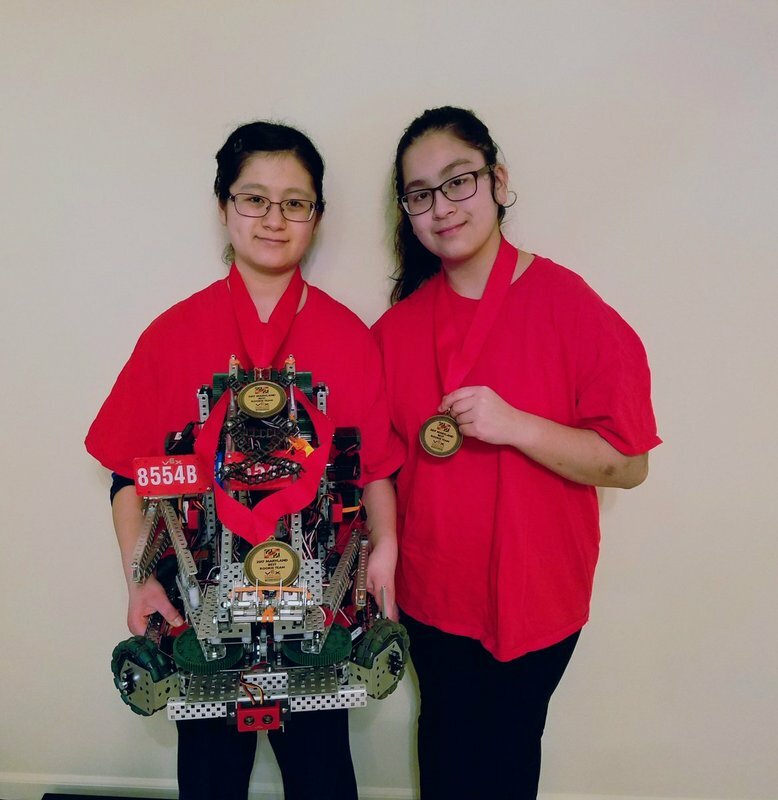 While Elizabeth researched past games and looked over the rules, Stephanie found a PDF detailing how to program the Robots cortex, and started to learn how to become the teams programmer. There was only four months until the game, and those four months past quickly. 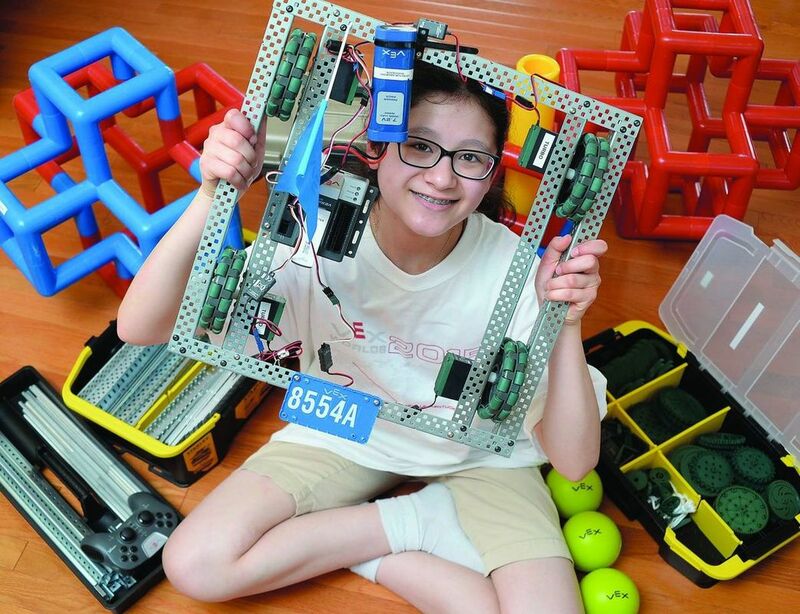 As the time before the game came closer, both Stephanie and Elizabeth started to put more and more time after school to finish the robot they had started. It came to a point where we even took the robot home to work on it, staying up late in the night to both program and build it. It was only weeks before the tournament when we managed to finish our first robot. The tournament was beyond amazing. Ten's of kids from different schools united by their passion for robotics, challenging each other with the robots that they created. Each game we competed in was both stressful and exhilarating, as if they were battles of life and death. Some games we lost, and some we won. With each lost we learned a little from it. With each win our spirits were lifted a little higher. By the end of the day, we had made it through to the semi-finals but wasn't good enough to push through to the next round. However even if we didn't leave the competition with a trophy, we left with one other thing, the experience and the will to try better next year. VEX Starstruck was about the best year we've had to date in terms of robotic design. Even though we failed to make it to World's, the experience itself was worth the effort and time. First of all, we as a VEX robotics team concentrate more on the skills programming than driver skills. It's what we are good at. Skills programming is what took us to World's in the 2014 - 2015 VEX competition and it's what we both enjoy to do the most. Also we as a self-sponsored team don't get a lot of time to practice as a driver. We just don't have the time to, what with homework, concerts, and other extra activities. So doing the programming was just easier to do and less stressful on our schedules. However this year was different. The game rules were changed in a way where getting to the next level based solely on programming power was impossible. So we were forced to design a robot that was skilled mainly in 'combat' in the games than the skills we were used to. And even though we were going to the exact same competition as always, the mindset we were going into the competition with was different. Even though we struggled through trying to find enough time to practice driving and also practicing and refining the program, we managed to come up with a unique design that managed to win us second place in the Maryland competition and carry us all the way to States. The thrill and excitement we got from learning that our small team made it through to States, without any prior advanced driving experience, was enough to keep us talking about it for days. Elizabeth (left) and Stephanie (right) holding up their robot for the VEX Starstruck season. This was taken after the Maryland State Competition in 2017 where we were awarded with Best Rookie Team (medals). Elizabeth Vicarte posing for a picture that was on the front page of the Herald-mail newspaper for May 17, 2015. 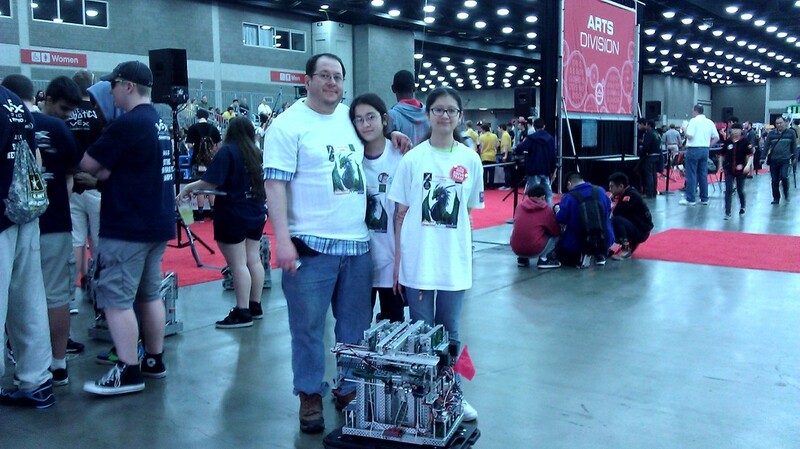 (from left to right) Our dad, Stephanie, and Elizabeth with our robot and team shirts at the 2015 VEX World Championship in Louisville, Kentucky. 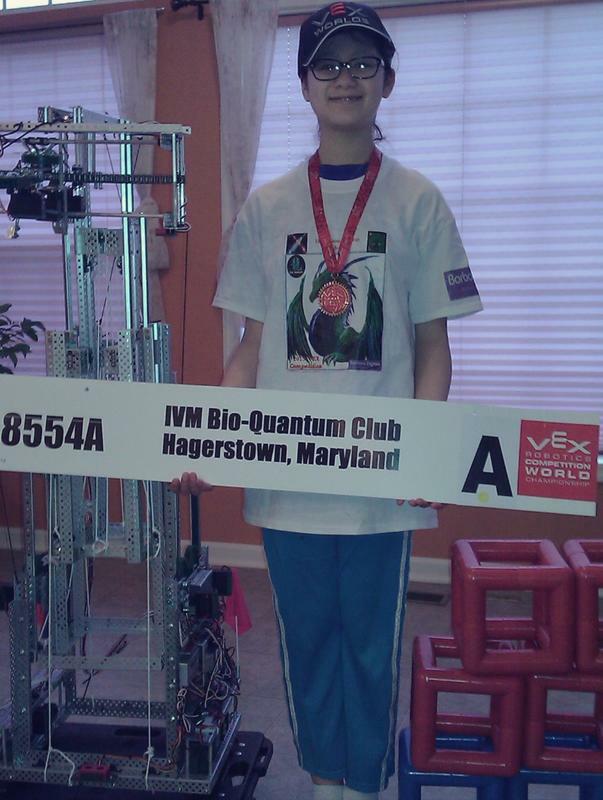 Elizabeth standing with the team banner and wearing the participation medal after getting home from the World Championship in Kentucky with the robot standing, at full height, next to her. 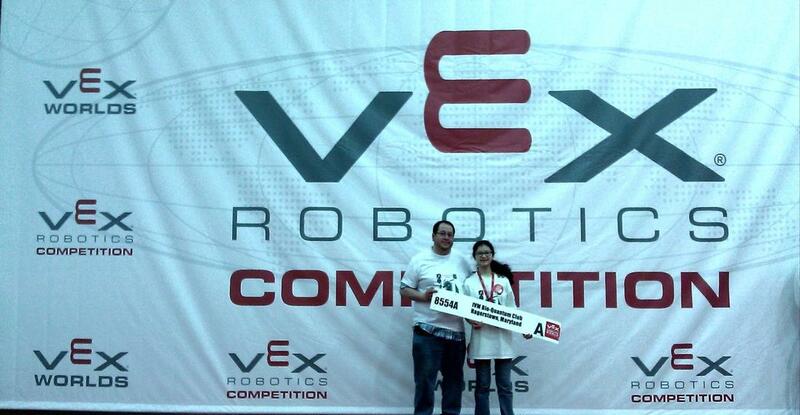 Elizabeth Vicarte with the 2014 - 2015 VEX season Design Award trophy, won at our local county competition, with the VEX World Championship participant medal around the neck. This was taken during an interview with the Herald-mail. All of our VEX awards and trophies. The two in the back are both Design Awards for seasons 2014-2015 and 2016-2017. The small glass trophy is a participation trophy for the Maryland State Competition of 2015. 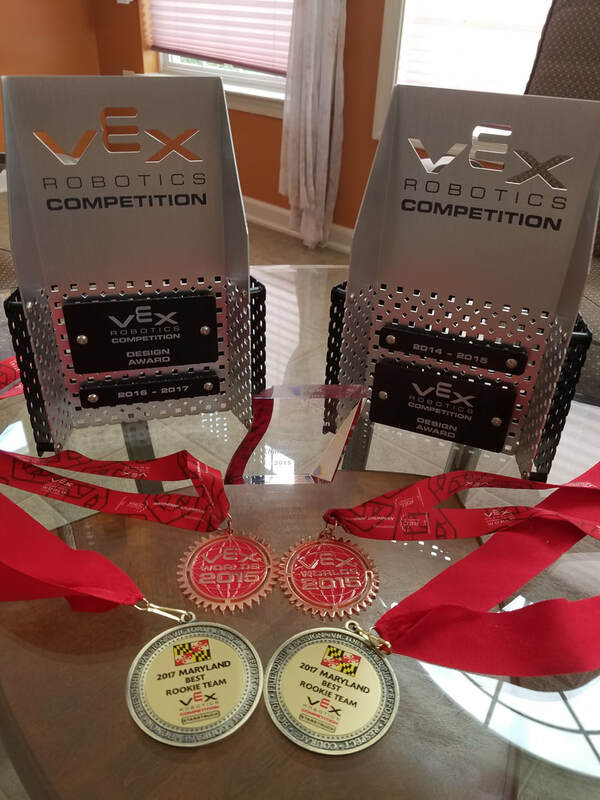 The medals in the back are for participation in the World Championship 2015 and the ones towards the front are for winning Best Rookie Team at the 2017 Maryland State Competition. Our dad and Elizabeth standing in front of the giant VEX Robotics background with our provided team banner at the World Championship in Kentucky. 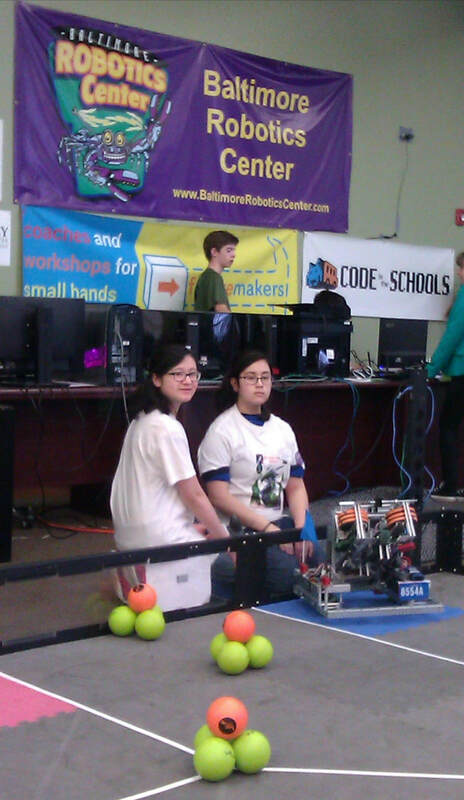 Elizabeth (left) and Stephanie (right) at the Baltimore, MD Robotics Center for a VEX Robotics Competition in 2015.